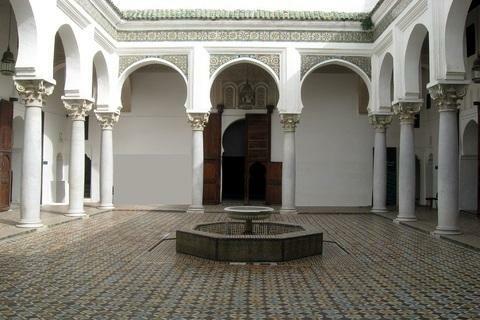 The Kasbah Museum (Musée de la Kasbah) in the Moroccan city of northern Tangier was until the opening of the Archaeological Museum of Rabat and Tetouan in 1930 the most important museum in the country. The museum is located in the former Sultan's Palace (Dar el Makhzen) on the Kasbah Rock of Tangier, above the ferry port. The Marshan necropolis is located on a rocky plateau just 1 km west. After the expulsion of the British in 1684, the Sultan's Palace, which was extensively rebuilt in the late 19th century was built on the Kasbah Hill. In 1922, parts of the former palace of the sultan were converted by the city's international administration into an archaeological museum. The museum based on numerous exhibits presented the history of the region around - probably founded by the Phoenicians - Tangiers (Tingis) from the Neolithic to the Portuguese period in the 15th and 16th centuries. Entrance with artesonado ceiling and six large wooden cases with iron fittings: Room 1: Stone Age finds (axes, spear heads, carved animal bones) and the first pottery, Room 2: objects of equipment (drinking lamps vases, jewelry and oil) from the pre-Roman era, chamber 3: marble funerary stele and other finds from the Roman era, Room 4 (former halo): large. Floor mosaic with the seafaring of Venus of Volubilis; Showcases with Greek vases. Gallery with Phoenician burial chamber; Stone and clay tile cysts, lead sarcophagi and urns from the Marshan necropolis, Room 5: throne or dining reception with beautiful artesonado ceiling (dome and stars) in room 6: almohade ceramics and coins and merinidischer time, space, 7: Observations from Ksar es-Seghir, including a Portuguese Manueline-style window: Room 8: artifacts from the period of Portuguese and British sovereignty over the city of Tangiers (1471-1684). Download the app for FREE and Enjoy the World. © Myooni Srl.S +39 388 3703703 - P.IVA 01660990191. All Rights Reserved.